Although I must admit that Jay-Z, Canibus and Papoose gave him a serious run for his money, peroxide blonde maniac Eminem has always been my favorite lyricist. There are no two MCs quite like him: his controversial rise to fame, his complex multi-syllable rhyme schemes, and his nonconformist attitude remain unequalled even after all these years. And though I may be biased -- I played The Eminem Show to pieces during the roughest patches of my parents' divorce -- one can't deny that, with more than 100 million albums sold worlwide, Eminem is a rap icon. Eminem is one of those artists that can really go into hibernation: he withdraws from the world completely, and just when you start thinking that he might be done with rap, he announces a new project, builds massive hype, and delivers one of the highest-selling albums of the year. It's almost predictable. And at the August MTV Video Miley Music Awards, Em managed to somehow do it again by coming out of nowhere to make this announcement. We should have seen it coming: his last solo effort, Recovery, which contained monster hit Love The Way You Lie featuring Rihanna and sold more than 10 million copies worldwide, already dated back to June 2010. Naturally, Twitter exploded. Not just because we would soon be getting new Eminem music, but more so because The Marshall Mathers LP is widely considered one of the best rap albums of all time. I almost started drooling at the thought of a sequel. At 41 years old, the Grammy-winning Detroit wordsmith has crafted perhaps the most balanced album of his wildly succesful career. His alter egos - the talented hit-maker, the controversial misogynyst, the lyrical acrobat, the clever comic & the tortured soul - all show up to deliver white-hot rhymes, the beats are stark and razor-sharp, and the featured artists actually add value. Love Game, featuring controversial Comptonian Kendrick Lamar, in fact, would probably be the best song on MMLP2 if it wasn't for Headlights. 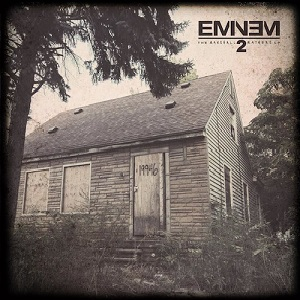 After years of murderous tracks aimed at his mother Debbie Mathers, Em offers her a sincere and heart-breaking apology toward the end of the album. Eminem need not be concerned for his legacy. It was never in doubt. And MMLP2 only further cements his status as a lyrical and conceptual mastermind. P.S. : The promotional rollout for MMLP2 is so damn impressive. Em is everywhere. Update 5: He released a new game slash contest called Slim's Pickins on his website. Update 6: He performed Rap God at the inaugural YouTube Music Awards. Em was also named Artist Of The Year. Update 7: Mr. Mathers also performed on Saturday Night Live. Update 8: He even joined forces with with Iron Man. Update 9: Complex Magazine is covering Eminem all week. 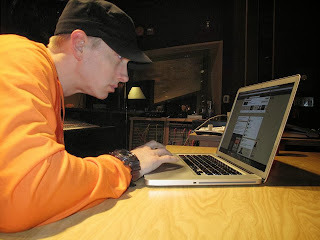 Update 10: On November 7, the notoriously tech-shy Mr. Mathers did a Q&A on Facebook. Update 11: Eminem performed at the MTV EMA's, won two awards, and produced this classic moment with Ron Burgundy. Update 12: MMLP2 hit No. 1 with 792,000 copies sold in its first week. Update 13: Em strikes again with a video for Headlights, tributing his Mom on Mother's Day.